This is a collection of short works, written between the 40s and the 70s. As usual in Schmitz’ short story collections a novel has been included. These are all non-Hub, non-Vega, non-Karres stories. Some are even not Science Fiction. Quite a few of them are dark, in the sense that they reveal a lot about the human condition. The Big Terrarium (1957): What would you do if you were the one caught in a cage in a zoo? This is the exact situation Fred and Marta Niedheim find themselves in when they, their farm and a tramp called Howard Cooney are transported into an alien zoo. Stuck with them is a friendly alien. Summer Guests (1959): Mel is starting off his two-week vacation. Upstairs lives Maria the artist. They discover that a storm has brought in two pixie-like creatures in need of aid. Mel tries to help them while not alerting his neighbor, but something seems to get in the way. Captives of the Thieve-Star (1951): For those of you who are familiar with The Witches of Karres this story shows you transmuted the protagonists into the familiar figures of Captain Pausert and Goth. Chanook, Imperial Secret Service applicant, and his diminutive wife Peer, daughter of the notorious space-rat thief Santis, find themselves in a load of trouble when they discover an abandoned space ship and try to salvage it. Caretaker (1953): Hulman has been stranded on Cresgyth, protecting the native human population from the encroaching blue worm-like creatures. An exploration ship comes knocking and one of the crewmen, Marsden, is filled with a sense of inexplicable horror when he sees Hulman’s paintings of the human natives. One Step Ahead (1974): “SKANDER WAR IMMINENT”. The Programmed Corps, the mightiest war-machine ever known, have been designed to fight the alien Skander. When they start leaving the planet of Ridzin, apparently to go to war, questions are asked. The League itself has many internal rivalries, each wanting to hijack the Corps to its own ends. So there is a lot of security protecting the soldiers. But there’s always someone one step ahead. Left Hand, Right Hand (1962): The Cassa expedition has finally landed on Cassa. Troy Gordon and his fellow humans have been captured by the hostile Hammerheads (Tareegs to themselves), who are preparing to invade Earth. After watching two of the crew tortured to death, Troy’s fellow humans are cooperating with the aliens to save their own lives. Troy is desperate to escape and warn home. But are his fellows as weak and soft as he thinks? The Ties of Earth (1955): Alan Commanger discovers he has an unusual ability to win crap games. This comes to the attention of something called the Guides. They ask him to come and talk to them – to discover whether he actually has special powers. It turns out he does. Somehow, he is able to move himself from one place to another. Then he wakes and discovers that he is in a store with a dead body. It seems someone is trying to set him up for murder. Spacemaster (1965): Haddan and friends tried to escape the City of Liot, ruled by the Spacemasters, and find a planet where they can live free. But they are caught, and Haddan discovers the real reason behind the Spacemasters’ behaviour. The Altruist (1952): Colonel Magrumssen has long been interested in the Mysterious. When a pair of scissors disappear from his desk and then reappear his interest is woken. Oneness (1963): Some years ago a bunch of convicts made their escape from Mars in a vessel using a stardrive system that Earth leaders want to get their hands on. One of the rebels turns up on Earth wanting to open negotiations. Earth is under the tyrannical rule of the Directors’ Machine. During the interrogation of Rainbolt it turns out that the escapees have established themselves on other Earth-like planet. Rainbolt has two reasons for coming to Earth: 1 – to gain access to Earth’s vast resources and 2 – to spread their philosophy of Oneness. We Don’t Want Any Trouble (1953): An apelike alien comes to Earth. The same evening the networks around the world are cleared for broadcast. Humans are deemed as being foolish, limited and incapable of harming the least of them. That means trouble – for humans. Just Curious (1968): Litton can become any other person for five minutes — which makes him the ultimate spy. But when one of his victims discovers him, he’s forced to become someone he would rather not. Would You? (1969): Geoffrey comes to visit Markus Menzies at his chalet. While being shown around the chalet, they come to an old chair. The chair promises one chance to change the past. What will Geoffrey do? These Are the Arts (1962): Hugh Grover learned of the Galcom craze through his friend Andy Britton. Symbols were being used in an advertising craze. The Galactic Community sent The Teachers to adopt Earth into the Community by instructing its inhabitants in a New Method of Thought and Communication. Hugh is highly sceptical and tries to warn the leaders of the Earth, after which he isolates himself until it is past. Then he discovers that his worst fears about its effect are true. Clean Slate (1964): Hair, one of the original Big Four, but now in disgrace, is put in charge of the ACCED project – an educational system. He is disturbed to find that it is not going well, and is sending children psychotic, but there seems to be no politically expedient way to shut it down. Hair does not give up his fight to get the authorities to listen and shut the project down. Crime Buff (1973): Jeff Clary is a wanted criminal and on the run. He runs into a large estate where he spies a plane. Desperate to get away, he goes into the house in an attempt to find someone who can fly it. He discovers Brooke Cameron and takes her hostage. He’s amazed and confused when she keeps trying to help him. Ham Sandwich (1963): Dr Ormond runs the Total Insight seminars, getting preferably rich people to donate money in the hope of improving their psychic powers. Two of the students are being advanced to an experimental study. Wallace Cavender signs himself in as a student to find out what is happening at the Institute. Where the Time Went (1968): The author George Belk is desperately trying to figure out where all the time he thought he spent writing is going. He cannot figure it out. A doctor sends a time-measuring instrument to home. An Incident on Route 12 (1962): Phil Garfield’s car breaks down on its way to Phil’s escape from the police. He stops a large sedan. When the driver comes out of the car, Phil shoots him. Oh dear, shouldn’t have done that. Swift Completion (1962): George Redfern has been trying to manipulate his wife into a situation that would leave him a widower. She is not helping things along. Then he discovers that his wife knows that he is trying to kill her. George is not giving up. 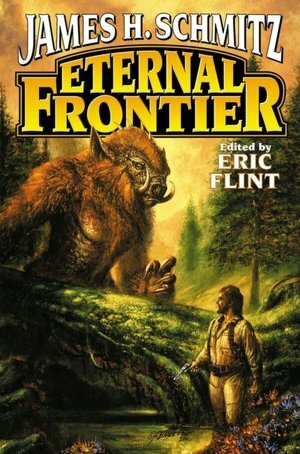 The Eternal Frontiers (1973) is one of Schmitz’ four novels. Due to separate living conditions mankind has largely divided into to species: Walkers and Swimmers. Crowell was born a swimmer, but has become a Walker by choice. He ends up caught in the middle of an altercation between the two groups. Then he discovers that an alien race is the root cause of the conflict, and he needs to convince both sides of what is going on.